For some time now I have been shifting my attention from Blogging to Twittering. I like the possibility Twitter offers me to have amazing conversations with professionals from all over the world. And these conversations have become very important for getting information, keeping in touch with everything that is going on and for getting insights and inspiration from experts. Besides being very active on Twitter I have started the WENOVSKI design thinkers community. This network is becoming very important and it give me more possibilities to connect to others. That's why I decided to move my blog there. So from now on I will post on WENOVSKI. I hope to see you there!!! View more documents from Hugh Graham. I've just been discovering Larry Lessing and his struggle. Very relevant in light of our growing capability of self-organisation. Watch this TED-TALK BY Larry Lessig, the Nets most celebrated lawyer, cites John Philip Sousa, celestial copyrights and the "ASCAP cartel" in his argument for reviving our creative culture. Great presentation by my good friend Erik Roscam Abbing (@roscamabbing ) of Zilver Innovation. View more documents from Erik Roscam abbing. Dan Saffer - Attention Awareness for Interaction Designers 2009 from Interaction Design Association on Vimeo. Stratus Air: A Cooper concept project from Cooper Journal on Vimeo. The book is ready, printed and I finally received copies!!! View more presentations from MarcStickdorn. View more documents from MarcStickdorn. 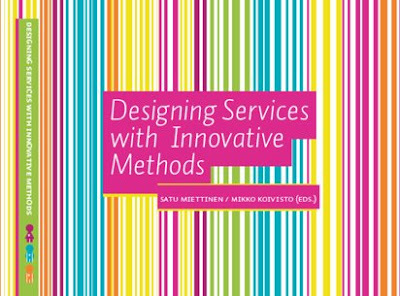 I participated in writing a book on service design called "Designing Services with Innovative Methods". This book presents the emerging and increasingly important field of service design. Lift France 09: Gunter Pauli: Changing the Planet from Lift Conference on Vimeo. Lift France 09: Dennis Pamlin: Changing the Planet from Lift Conference on Vimeo. Lift with Fing 09: Timo Arnall: "Making Things Visible" from Lift Conference on Vimeo. A few weeks ago I started WENOVSKI a design thinkers network. This network will function as a platform to design thinkers from whatever discipline, to connect, share and find ways to work together. There are 144 members to date. One interesting development on WENOVSKI is the forming of groups based on nationality and/or language. France, Australia, Dutch, German speaking, Spanish speaking. But the other groups are no less interesting: AIGA (the professional association for design), Design Thinking Education, project group Inner-city Education and Social Designers. I'm very exited by all these activities. Final Service design concept from eilidh dickson on Vimeo. 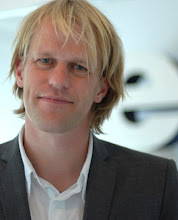 Warm Hands Network concept video from Magnus Bendtsen on Vimeo. Introduction to Collective Intelligence from TheTransitioner on Vimeo. "You never learn by doing something right ‘cause you already know how to do it. You only learn from making mistakes and correcting them." "Design and "design thinking" is gaining recognition as an important integrative concept in management practice and education. But it will fail to have a lasting impact, unless we learn from the mistakes of earlier, related ideas. For instance, "system thinking", which shares many of the conceptual foundations of "design thinking", promised to be a powerful guide to management practice, but it has never achieved the success its proponents hoped for. If systems thinking had been successful in gaining a foothold in management education over the last half of the 20th century, there would be no manage by designing movement, or calls for integrative or design thinking." 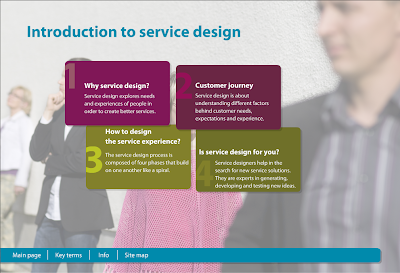 A new website on Service Design research "SDR"
"What is the Service Design Research initiative? It aims to collectively build an understanding and foster a dialogue on where ideas and concepts of Service Design have come from, how these evolved over the last two decades as well as report and review current research and service design practices. The motivation is to consolidate existing knowledge and to support the growth of a research community that engages in meaningful research relevant to the challenges design is dealing with today and in the future." "The Creative Company Conference is an event that has the potential to become one of the leading gatherings of creative minds in Europe, if it will have the courage to harness the energy and creativity of its attendees." KBIRI.NL - Sir Ken Robinson @ Creative Company Conference from KBIRI on Vimeo. View more presentations from Futurelab. Resonance from Continuum on Vimeo. Last week I gave a lecture and a workshop to students at the Management Center Innsbruck. The university is beautifully situated in the heart of Tirol, and the part were I gave my lecture had a grand view on the white peaks of the Alps. Besides this great scenery the people were extremely nice and welcoming. Needless to say I had a great time. And I'm looking forward to my next lecture. I liked working with the students. They were noisy but attentive, just the way they should be. After my lecture we practised in brainstorming and lateral thinking and started working on their case study (the Alpen Zoo). Below you'll find the first (and somewhat philosophical) part of my lecture. After this we discussed the realities and challenges of service design projects and I explained some service design methods. View more presentations from designthinkers. 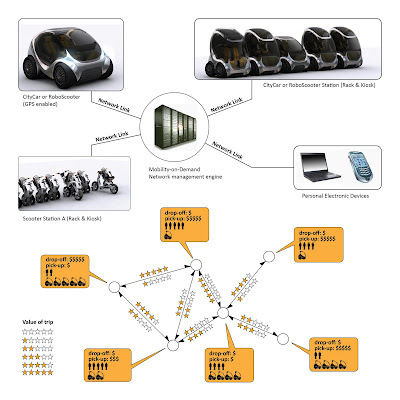 "Mobility-on-Demand systems utilize fleets of shared-use lightweight electric vehicles placed at automatic charging racks throughout a city. The CityCar and RoboScooter, both folding vehicles, along with the Green-Wheel Bicycle, minimize parking space and can be picked-up and dropped-off at any rack. Mobility-on-Demand systems maximize mobility and dramatically reduce congestion and pollution through energy and land-use efficiency. Marc Rettig - How to Change Complicated Stuff from Interaction Design Association on Vimeo. Tim Hill (FutureBrand) with a statement about the role of customer service in a downturn. DC wants to hear citizens’ ideas about problems that could be solved through technology, as well as their ideas about the perfect system to receive feedback and service requests. Apps For Democracy Community Edition from Peter Corbett on Vimeo. Thinkpublic created this short film about what they do and how they do it. thinkpublic: social innovation and design from thinkpublic on Vimeo. I gave an interview to Davison Creators. Michaeldila started a search via Twitter for literature on design thinking and ended up with an impressive and still growing list. View more presentations from brandonschauer.